“The Healthcare Laundry Accreditation Council (HLAC) is the authority on laundry standards for the preparation of hygienically clean, reusable healthcare textiles.” Defining everything from physical design and ventilation to equipment maintenance, work flow, hazardous materials, pharmaceutical waste, equipment, contingency planning, employee safety, and more. HLAC standards provide the definitive criterion for processing reusable textiles for use in healthcare facilities. 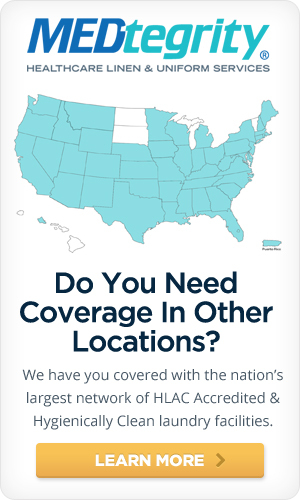 While not all MEDtegrity facilities are HLAC compliant, MEDtegrity is the nation’s largest HLAC accredited network. 2. Centralized Services Simplify Your Purchasing Program. One agreement covers all locations — whether you have multiple facilities in a single market, facilities that span one or more regions, or a nationwide network. Same pricing same terms. One contact person for all communications: to add or change services, resolve problems, or provide cost reports and analysis. If you prefer, MEDtegrity can provide a single invoice consolidating all deliveries nationwide at a billing frequency that’s convenient for you. Each of our members is independently owned and operated — and the owners are directly involved in every market. Straightforward, accurate, and honest invoices. Servicing surgical centers, medical practices, and all types of outpatient facilities.